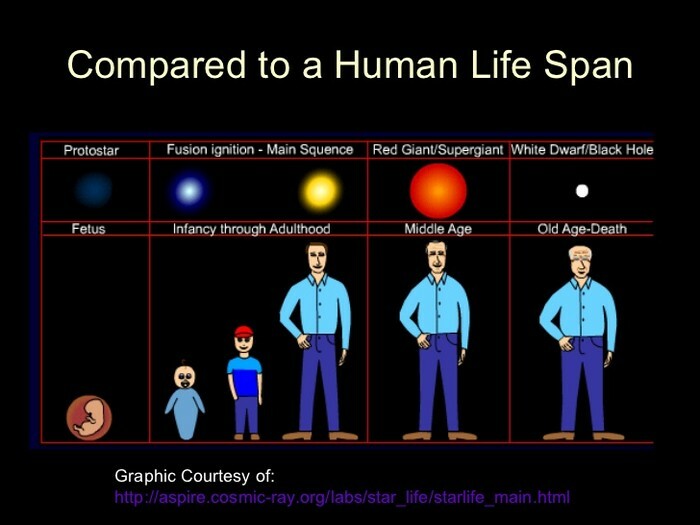 Human life and Star life are very similar. The first stage of human life is the Fetus, the first stage of star life is the Nebula. From there they both are the same, both grow and keep producing till they can't and eventually die. Main Sequence- The main sequence stage is the stage in a Star's life where it is fusing all of its hydrogen from core nuclear fusion and gravitational forces pushing inward. Fusion is an atomic reaction in which multiple atoms combine to create a single, more massive atom. A Red Giant is a star in the end stage of its life, it no longer has hydrogen in its core and it eventually dies. The four ways a star can die are a white dwarf, a supernovae, black hole, and a Neutron star.